Lemons are good for more than just lemonade! They can actually be used as a natural cleaning alternative. Read on to learn seven great ways to clean with lemons! When life hands you lemons, open your arms wide and say, “It's time to clean!” because lemons can do much more than just make lemonade, and lemons can freshen more than just your food. With their powerful antibacterial and grease-fighting abilities, lemons have practical uses all over the kitchen. Just think about it. What other fruit deodorizes, bleaches, cuts grease, and smells great too? No wonder so many people are incorporating these citrus gems into their everyday DIY cleaning routines. Thankfully, sometimes the best choices for non-toxic cleaning are right in front of our noses… or in the refrigerator. Lemons can be used make your microwave spotless -- no scrubbing required. Fill a microwave-safe bowl just under 3/4 full with tap water. Add five to ten lemon slices to the bowl, squeezing some of the juices into the water. Place the bowl in the microwave and turn it on high. I set my timer for 5 minutes and checked in every few minutes to see if the water had started boiling. Once the water comes to a boil, stop the microwave. Let the steam build up for a minute or two, then open the door and carefully remove the bowl of water. Wipe down the interior with a damp cloth, and follow up with a dry cloth to remove any streaks. Watch this video if you're more of a visual learner! To remove tough food stains from light wood and plastic cutting boards, slice a lemon in half, squeeze onto the soiled surface, rub, and let sit for 20 minutes before rinsing. Do you want to deep clean your cutting boards? Then give them a spa treatment. Pour a handful of salt on the board and then scrub it with your lemon half. This technique will remove berry stains and coffee rings too! The best part? You'll have a house that smells like a lemon grove rather than chemicals! 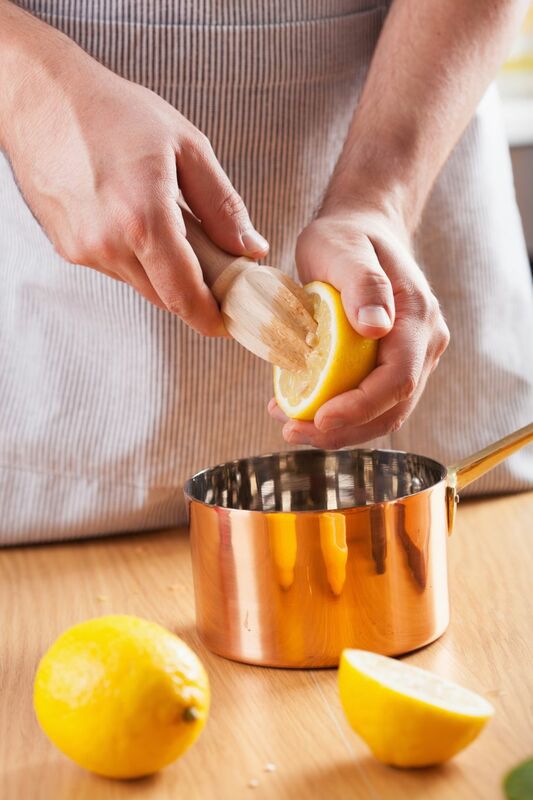 No matter how tarnished your copper cookware, a lemon can make it all better. All you need is a lemon and some coarse sea salt. Simply sprinkle the cut side of a lemon half with the salt, then rub it all over the copper, which will soon shine brightly! A trick to kick that funky smell coming out of your garbage disposal is to throw in some ice cubes, a handful of kosher salt, and lemons, limes, oranges, and anything of the sort. You could use just the peels, or even entire whole fruits if you want, which might be a good idea if they're spoiling already. Save lemon and orange rinds to deter squirrels and cats from digging in your garden. Store rinds in the freezer during the winter, and then bury them just under the surface of the garden periodically throughout the spring and summer. If you still have unwanted felines, just remember that cats steer clear of strong citrus scents. To ward off unwelcome furballs, throw peels directly on the garden. Adding a cup of lemon juice to your laundry replaces chlorine bleach and does an even better job of whitening. It also leaves a refreshing, lemony scent on your clothing. Doesn’t that make you happy just thinking about it? Plus, which would you rather accidentally spill on yourself? Lemon juice or bleach? Exactly! Does your dishwasher have a funky smell to it? Lemon juice can take care of that. Add 1 cup of lemon juice to a coffee cup or other dishwasher-safe container, and put it on the bottom rack in the dishwasher. Run the rinse cycle. Once finished, your dishwasher will not only be deodorized, but clean too. As you can see, the humble lemon is quite a handy fruit! Use these easy, natural cleaning tips for your home's upkeep and turn that sour stank into sweet, clean goodness.